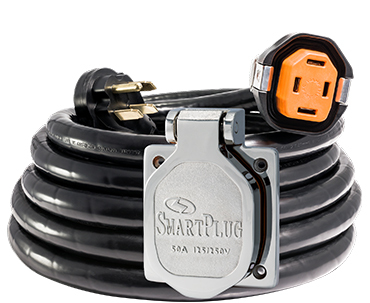 Multi-Point Locking System – Side clips lock the plug body securely into the inlet which eliminates any stress on the electrical connection from movement of the power cord. Weatherproof Seals – Multi-fin silicone gaskets installed in the interior of the plug body eliminate any water penetration when plug is connected to inlet. Blue LED Power Indicator Light – Dual LED bulbs.